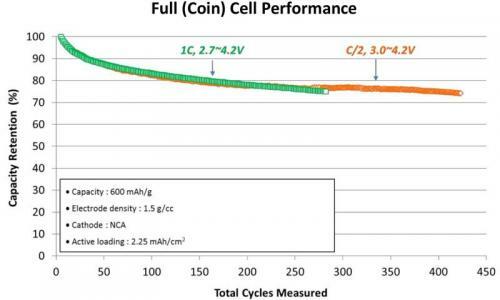 The American XG Sciences demonstrated full battery cell cycle stability, through more than 400 charge/discharge cycles, with a charge storage capacity of 600 mAh/gram over a broad voltage window in its next generation silicon graphene anode materials for lithium-ion batteries. The company states that their latest material is the first commercially viable silicon and graphene based anode formulation to achieve this all important performance threshold, with charge storage capacity of up to 4 times today’s typical anodes, first cycle efficiency of 85-90%, low swelling and life that is more than double the company's previous generation. XGS produces the anode material through proprietary manufacturing processes and uses its xGnP graphene nanoplatelets to stabilize silicon particles in a nano-engineered composite structure. Company representatives say that XGS is working with battery manufacturers globally to incorporate XG SiG anodes and xGnP graphene conductive additives into their products. Multiple battery formats and multiple battery design capacities are under test. In January 2014, Samsung invested in XGS to co-develop graphene-based batteries.